If you're looking to secure your GoPro or other action camcorder in your car while you're getting your fast and furious on then look no further! 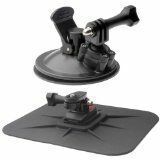 Kit includes suction cup windshield mount and dashboard mount. Compatable with GoPro and most action camcorders.